We are all aware of the controversy over whether or not Mahmoud Ahmadinejad should have been invited to speak at Columbia University when he was here earlier in the week. Because he was in the news so much, I got curious about what made this frumpled looking arrogant little man tick, so I did his chart, and some of the ties I saw from it to the U.S. chart I follow were quit disturbing. I use the chart for the signing of the Articles of Confederation, which took place on November 15, 1777 at 12:46 PM in York Pennsylvania. This is the suggested horoscope of deceased astrologer, David Solte. I have been concerned about what might transpire with transiting Pluto at 26 Sagittarius 24 in the 10th house squaring progressed Neptune at 26 Virgo 42 in the 7th house. Well, in working up Ahmadinejad?s chart, (birth date October 28, 1956 Garmsar, Iran..time unknown) I see an alarming connection. 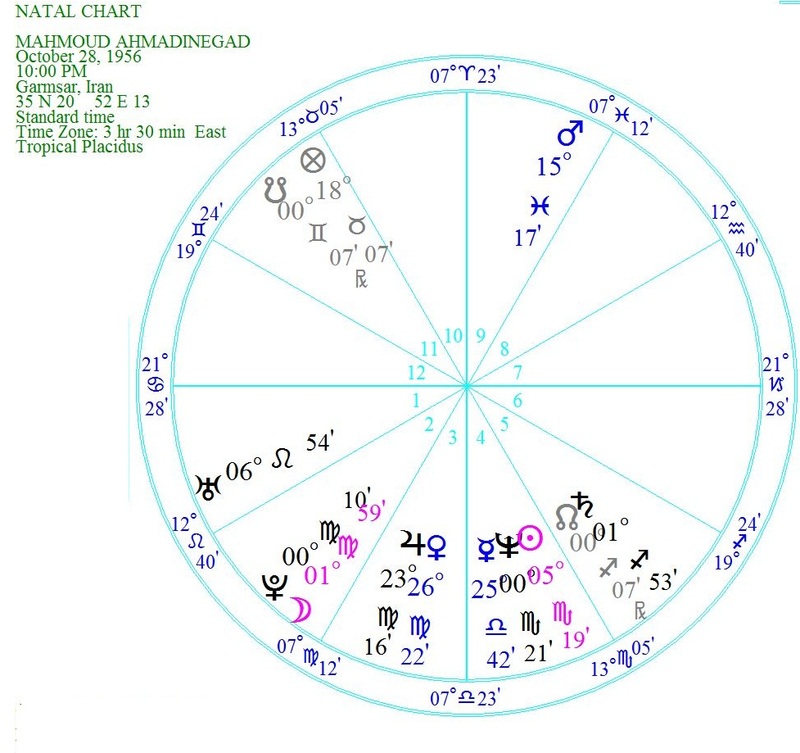 Ahmadinejad's progressed Sun is at 26 Sagittarius 19, and of course conjunct transiting Pluto (power) which squares progressed U.S. Neptune (deception). So his statement about using his nuclear program for strictly peaceful purposes is definitely not to be believed. His natal Sun at 4 Scorpio 42 (the all or nothing sign) that rules nuclear energy conjoins the progressed U.S. Moon at 3 Scorpio 57 in the 8th house. Besides that, his natal Neptune at 0 Scorpio 20 and his progressed Neptune at 02 Scorpio boxes in and squares U.S. progressed Pluto at 1 Aquarius 05R in the U.S. 12th house. This seems like he is playing a dangerous cat and mouse game with us, with him being the cat. Anyone who denies the holocaust happened and says that Israel should be wiped off the map is not playing with a full deck, as the last few years with his progressed Sun in boastful and expansive Sagittarius squaring his natal Jupiter at 23 Virgo 12, and his natal Venus at 25 Virgo 52 attests to; telling us that his judgment is way out of whack. Besides that transiting Uranus is hovering over his natal Mars in Pisces (oil) at 15 Pisces 12, so we are actually at war with Iran by proxy. He says that he absolutely refuses to abandon his nuclear program, and we absolutely can?t let him reach his goal ..so where do we go from here? The price of oil has shot up by 20 % in less than two months as the energy market digests the prospects of a wider war with Iran. Three profoundly powerful geopolitical forces are at work here. Number one is Russia, who has put its weight behind Iran, as a partner on grand energy projects, military weapon shipments, nuclear technology export, and cooperative efforts to sell oil in non-US$ denomination. Number two is China who has put its weight behind Iran, as a partner on grand energy projects also. If Iran is attacked by US Military forces, or by allied Mid East forces, Russia and China might engage in temporary embargo actions against the United States, even actions joined by Venezuela. The third factor at work stands clearly as superior Sunburn missiles pointed at US warships in the Persian Gulf, likely to destroy at least one aircraft carrier. Such a loss would be a huge black eye not desired. A vulnerable time for further developments ensuing might be the middle of December, as on the 19th Pluto and the Sun move up to 28 Sagittarius 43 and square natal U.S. Neptune at 28 Virgo 43, with Mercury at that point a few days earlier, and Jupiter reaching that point on the 11th. Furthermore, Saturn is in Virgo now, bringing back things from its past transit of approximately 30 years ago. Remember, back then, we had the Iranian hostage crisis that started on November 4, 1979, when 52 people were held in captivity by the Iranians for 444 days. So now that Ahmadinejad is the one who is front and center in Iran, with all of his theatrics, as his Moon in Leo attests to, his political savvy and strategic intentions should not be underestimated. Keep your fingers crossed that we can finish out the year in dealing with him in a diplomatic fashion, and not have a serious escalation of this dangerous situation.